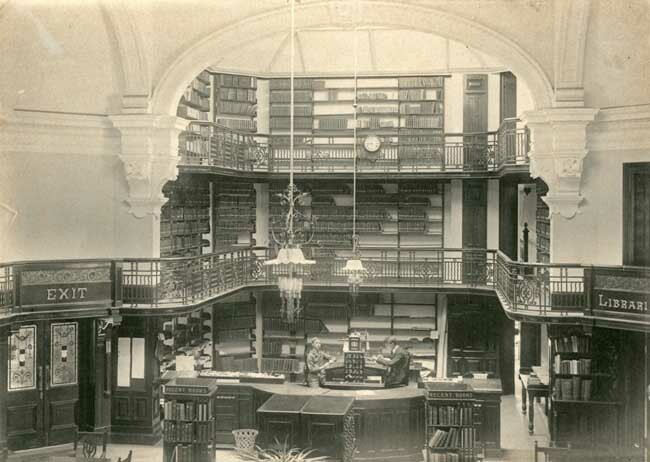 The Library shortly after its opening in 1902. Men in typical dress of the time. 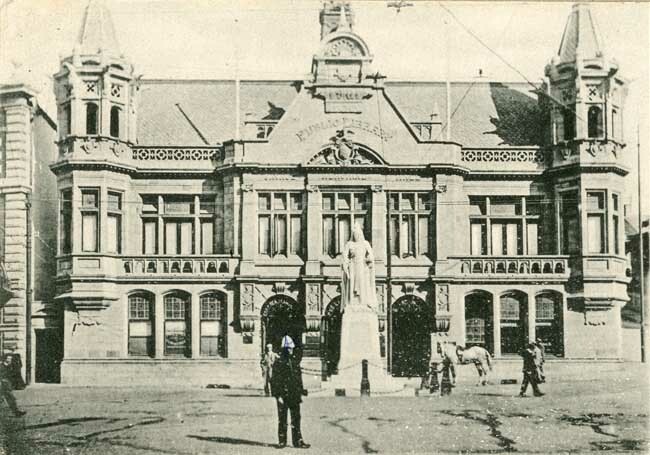 The Library in 1905, showing the Queen Victoria statue which was erected in 1903. In foreground, policeman in uniform of the time. 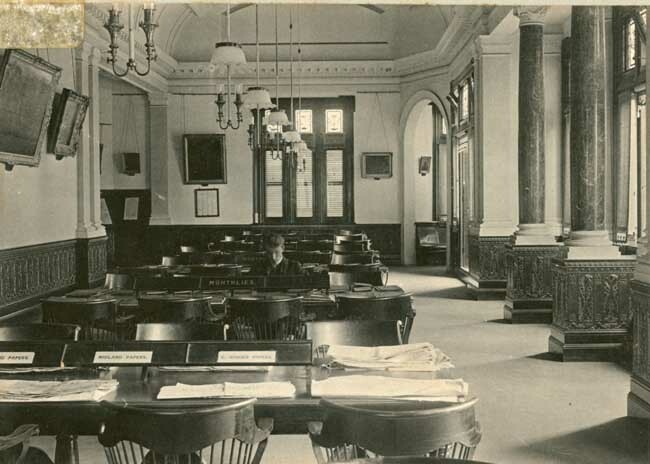 South African Room, c, 1903. 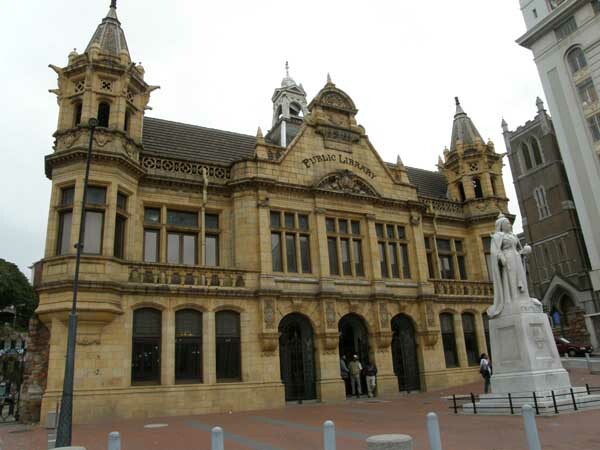 Baines' paintings not on display. 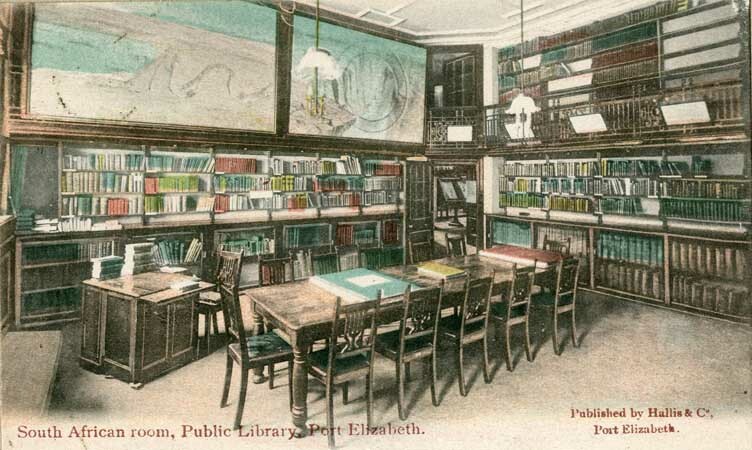 Colour picture-postcard of the South African Room in the library, c.1905. 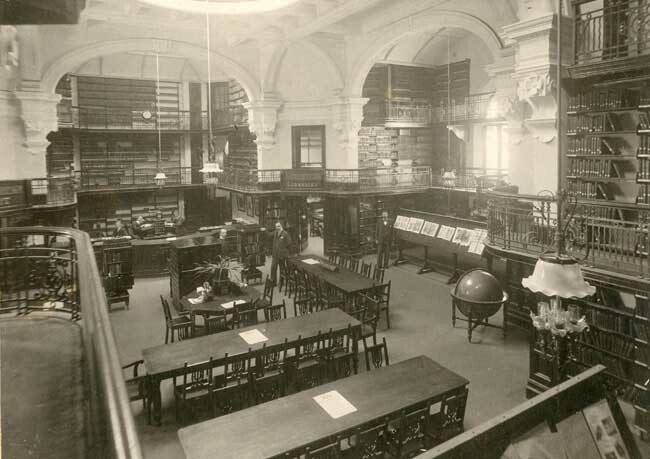 View of main hall in library, c. 1906-8, looking towards service counter. Shows Mr. F.W. 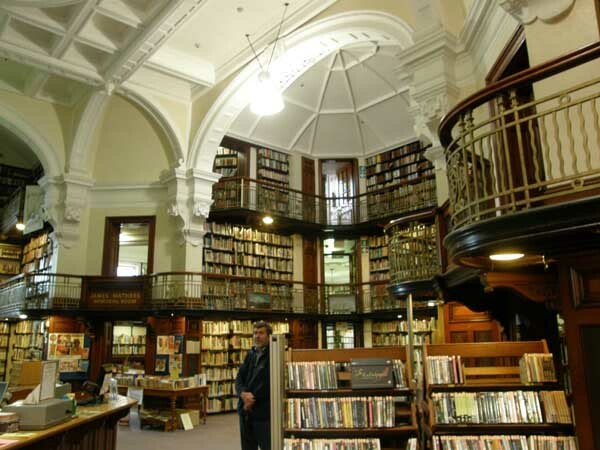 Cooper, Librarian, and Percy Evans Lewin, Deputy Librarian, and three male assistants. 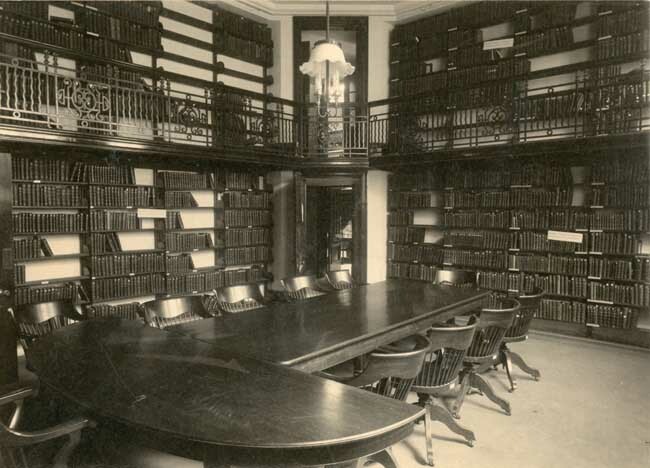 View of northern end of subscribers' reading room, c.1906. 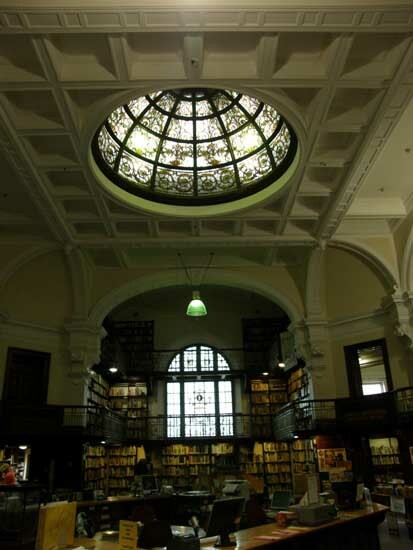 View of service counter. 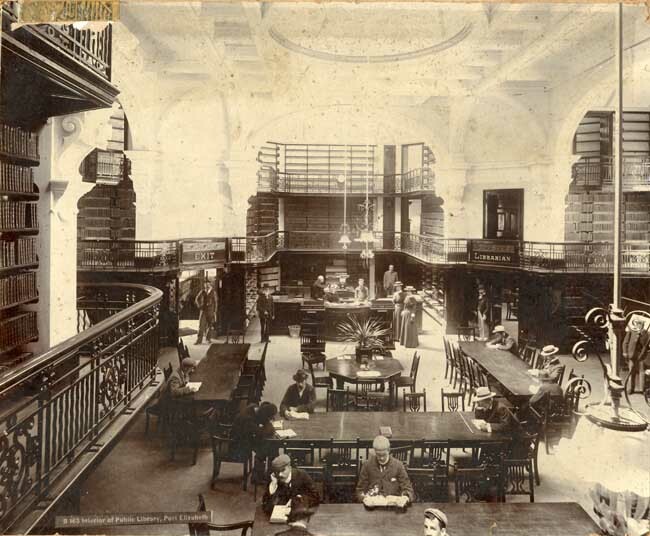 Main Hall, and book galleries, c. 1906. 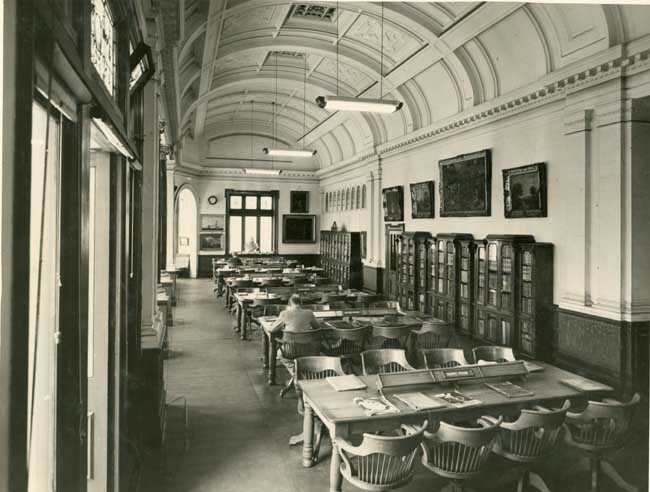 View of main hall looking towards service counter and librarians office, c 1920s. 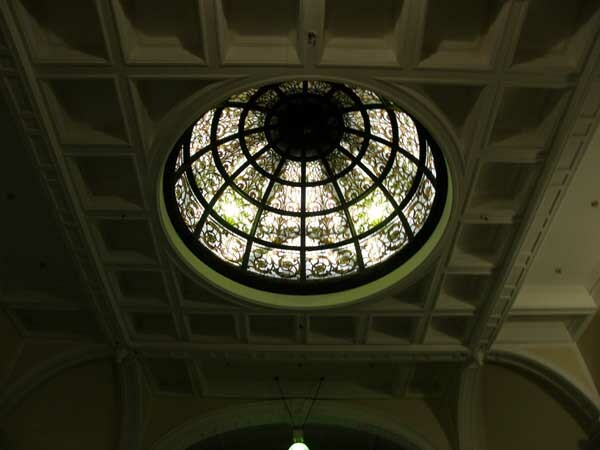 Electric light has replaced gas. 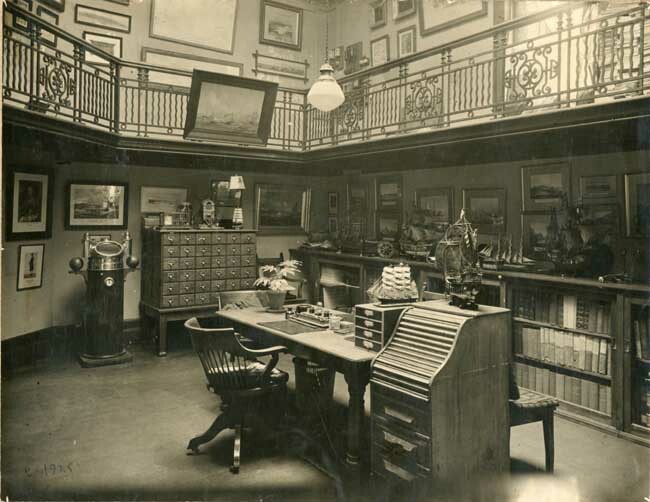 Librarian's office, early 1930s, with ship models, prints and binnacle from the "Western Knight". 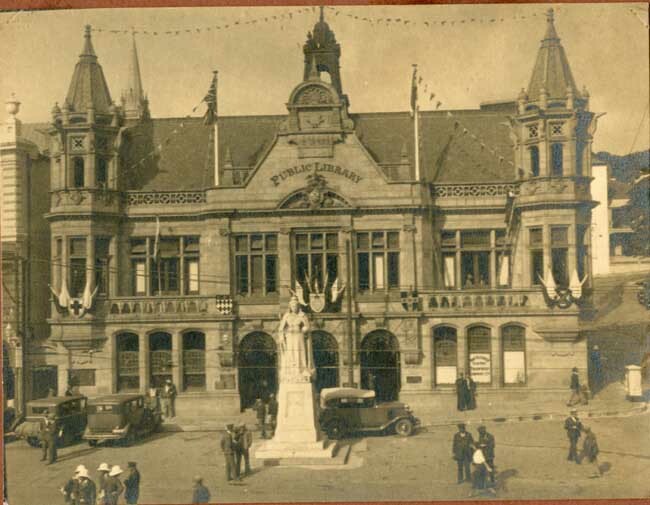 Library building decorated for King George V's Silver Jubilee, 1935. 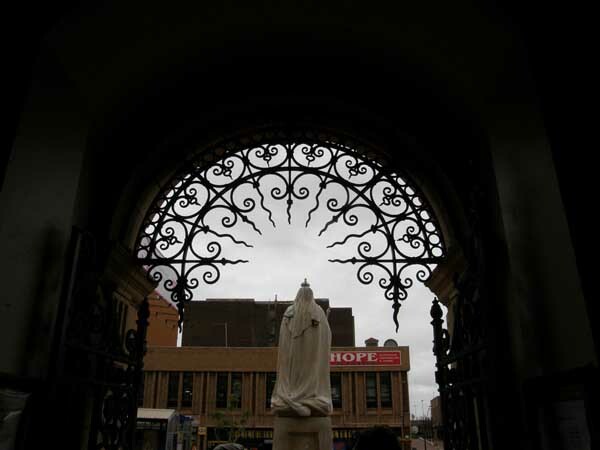 Shows Queen Victoria statue and typical cars of the period. 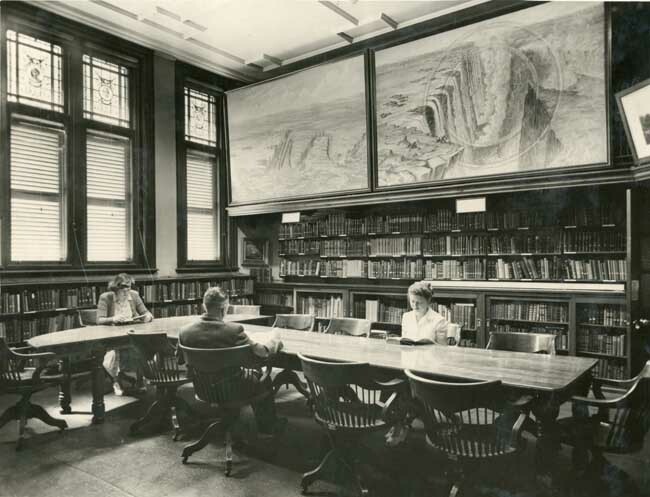 Photograph of African Room, 1952. Shows Thos. Baines' paintings of Victoria Falls, Seated at table. Miss Amy-Rose Wells, Mr. A. Porter, Deputy Librarian, Miss Ray Reich. 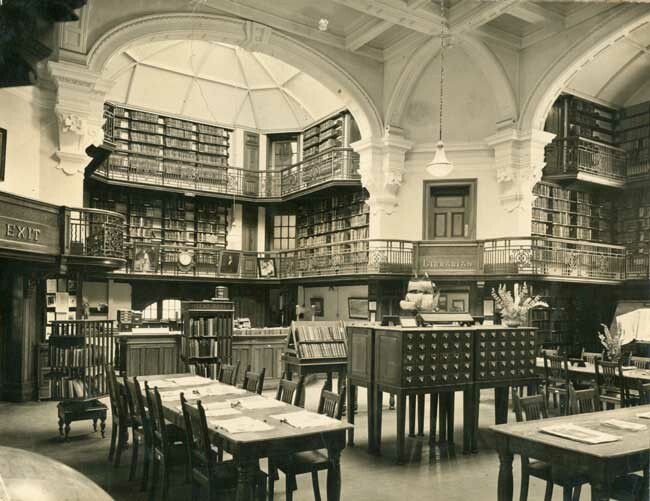 Subscribers' reading room, 1952. 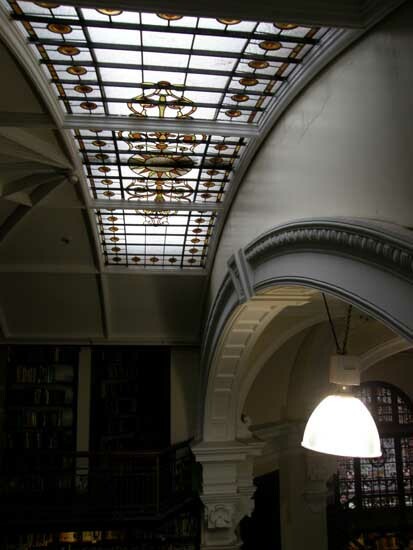 Neon-tube electric lighting. 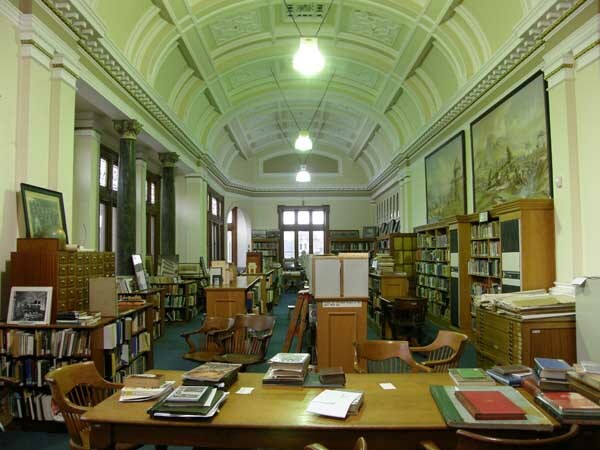 Bookcases containing Ascham Music collection and John Owen Smith Collection. 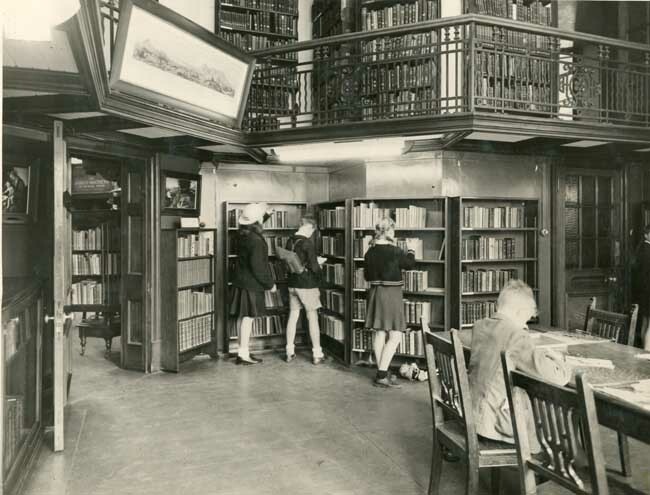 A corner of the children's room, 1952. School children in school uniforms. 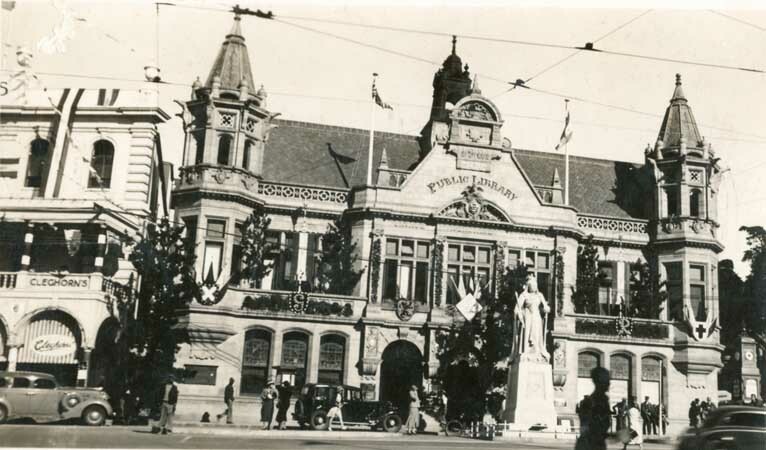 Library building decorated for the coronation of King George VI, 1937. 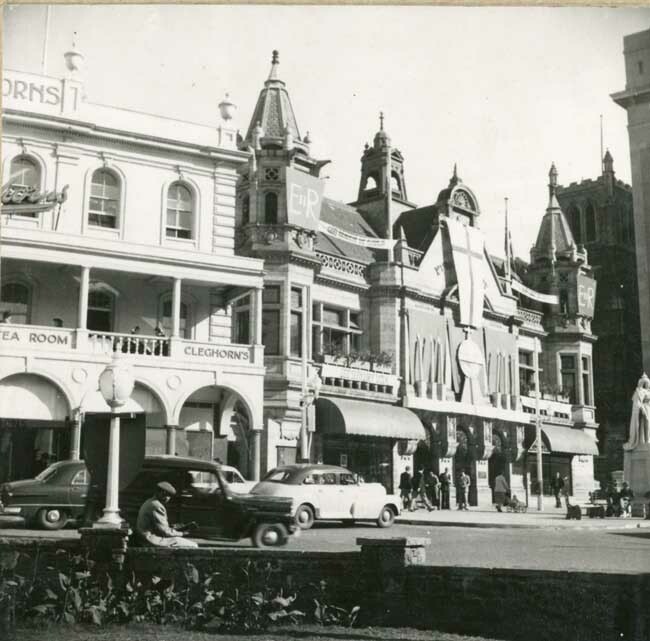 Library building decorated for the coronation of Queen Elizabeth II, 1953. 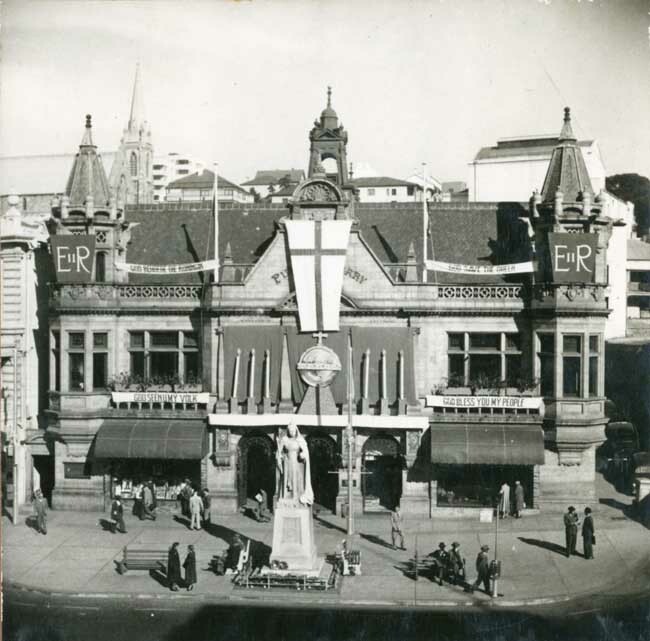 Library building decorated for the coronation of Queen Elizabeth II, 1953. Shows typical cars of the time. 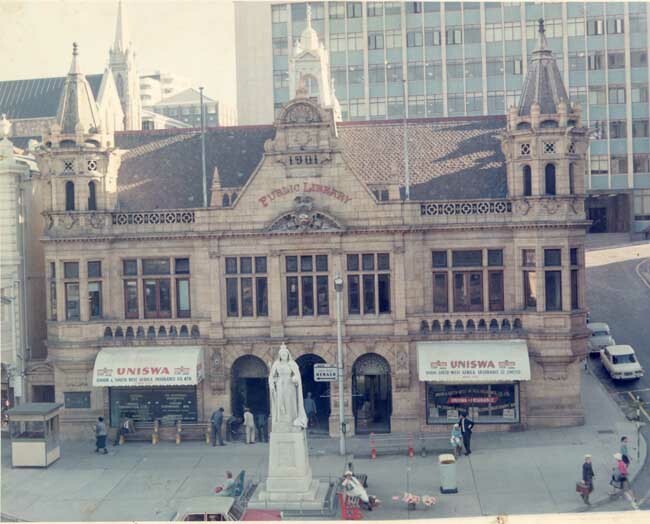 Colour photograph of the Library building, c. 1966. 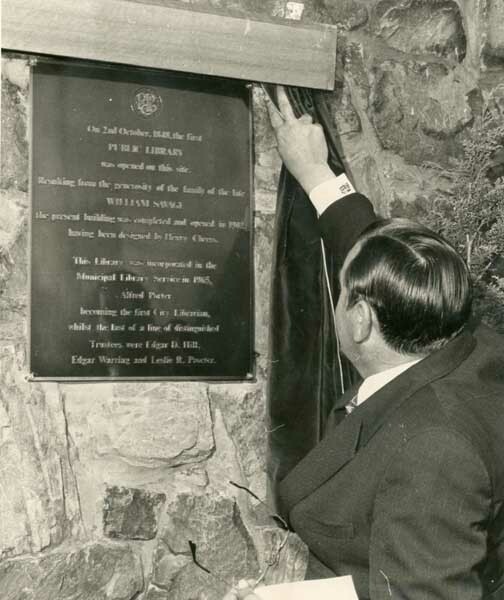 Unveiling of the memorial tablets commemorating the incorporation of the library into the municipal library service, 17th July, 1974, by Mayor J.W. Kleynhans. 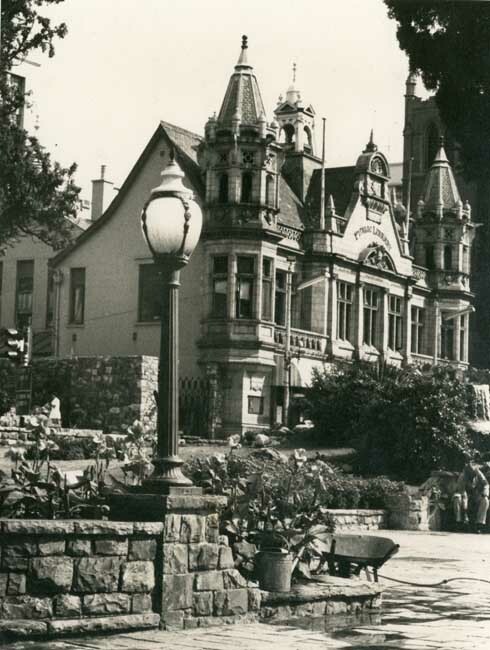 View of Library building from the Mayors Garden, 1976. 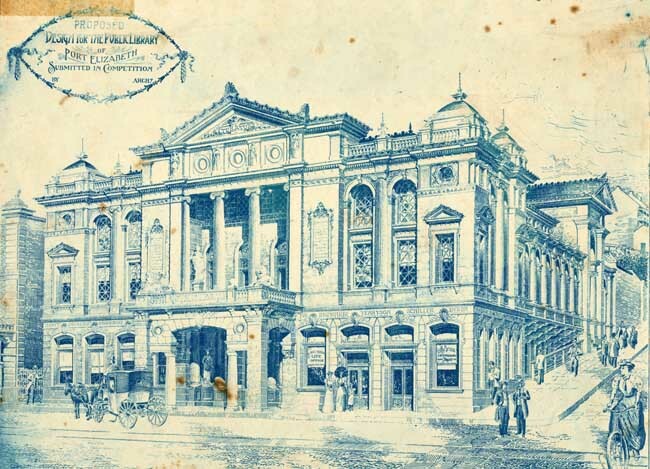 Architect's perspective sketch of library as it was built and opened in 1902. 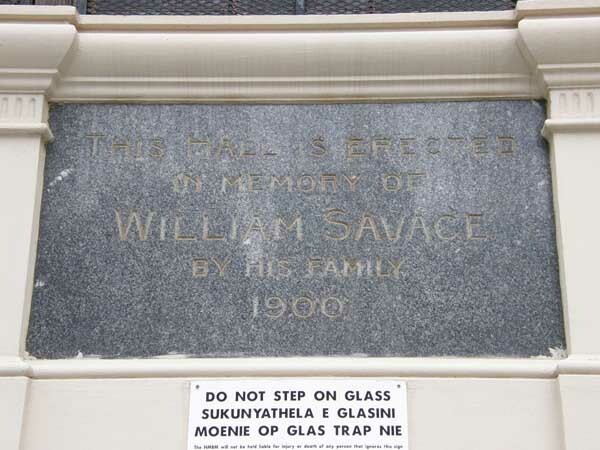 Prize winning design 1897. Depicts men's and women's fashions of 1897. 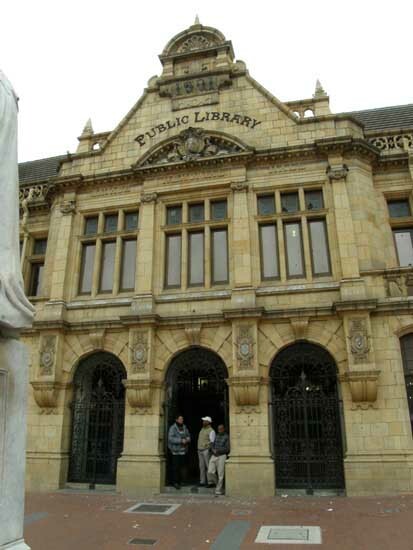 Alternative design for the Library 1897. 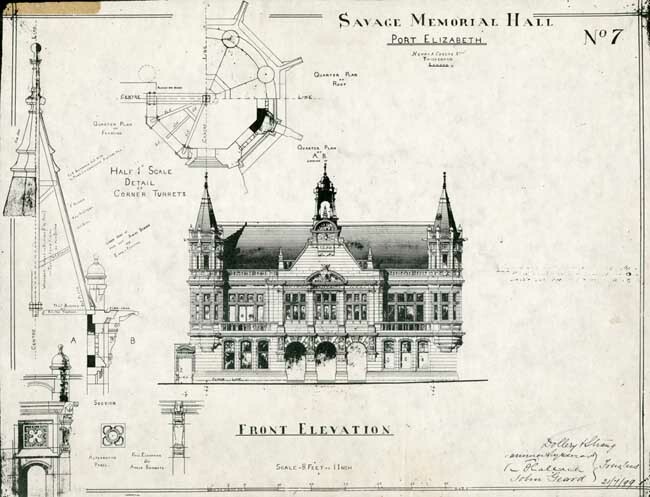 Working plans of the Public Library building, by Henry A. Cheers. Photocopies originals in (City Engineer's Dept.). 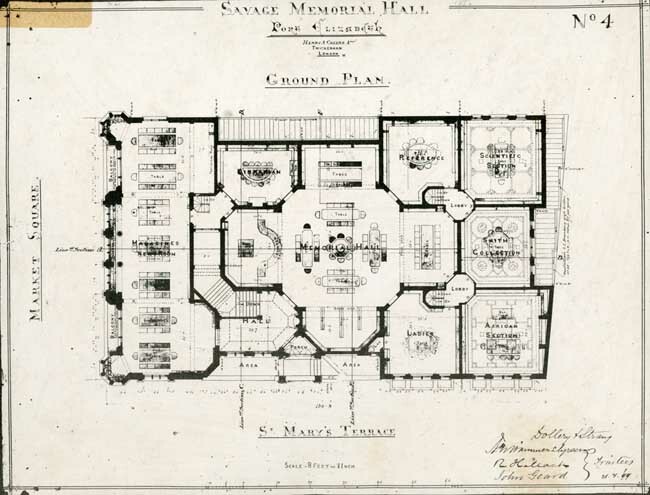 Ground plan. 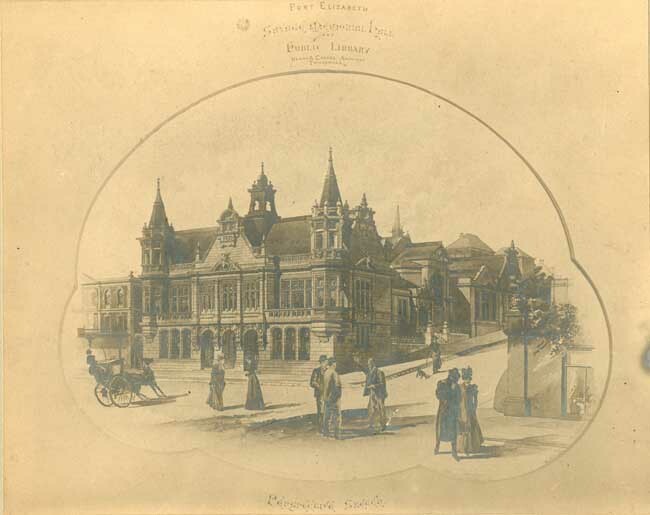 Working plans of the Public Library building, by Henry A. Cheers. Photocopies (originals in City Engineer's Dept.). 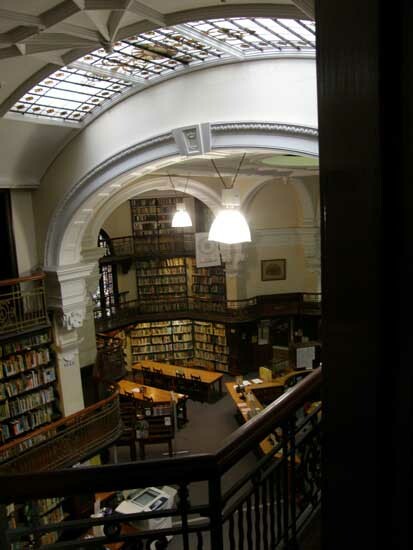 No.2 Gallery level. 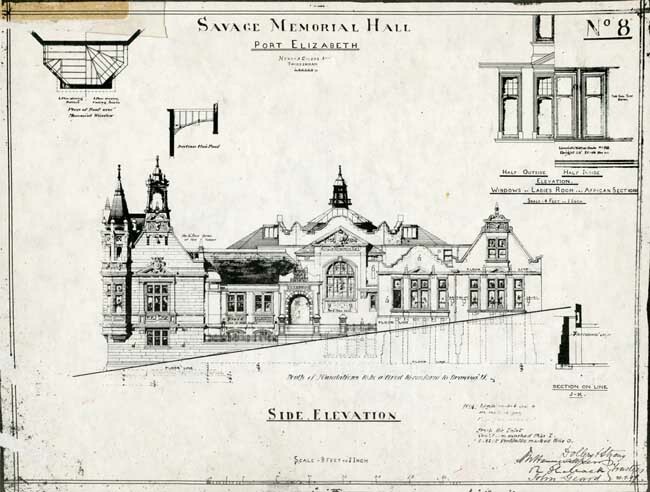 Working plans of the Public Library building, by Henry A. Cheers. Photocopies (originals in City Engineer's Dept.). 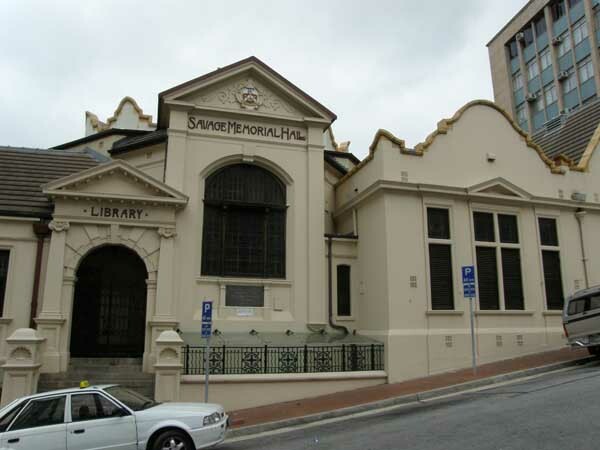 Front elevation. 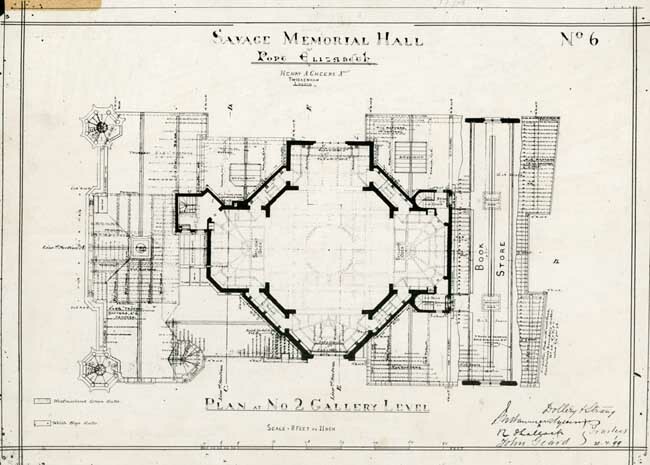 Working plans of the Public Library building, by Henry A. Cheers. Photocopies (originals in City Engineer's Dept.). 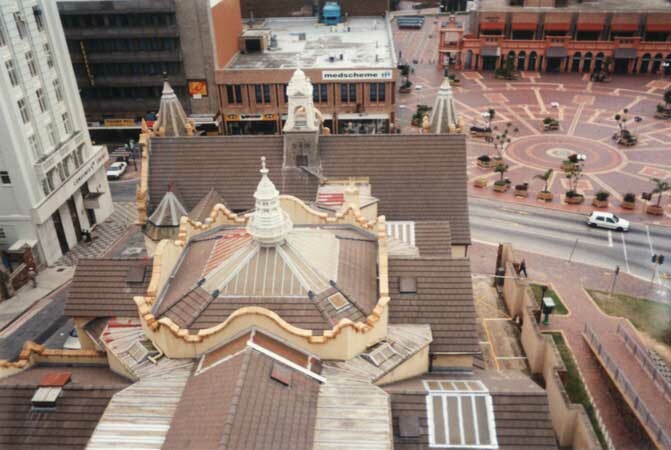 Side elevation.